Mike Birkbeck made the Brewers' starting rotation in 1988, but it was slow going, according to The Milwaukee Sentinel. Birkbeck was the Brewers' fifth starter and, by April 23, rainouts meant he'd only gotten into one game. In that one game, he went just 1.1 innings, giving up six runs. "I knew this would be my role," Birkbeck told The Sentinel after the latest rainout that April. "I just have to make the best of it. It's frustrating, but there's not much you can do about it." Birkbeck was in his third major league season that year, having pitched in seven contests in 1986 and another 10 in 1987. 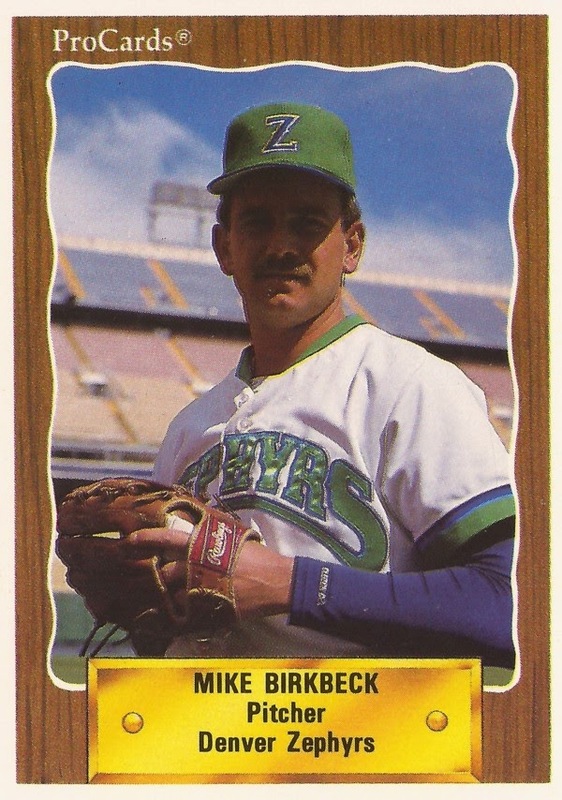 After that slow start, and a trip back to the minors that year in 1988, Birkbeck went on to start 23 games for Milwaukee. He compiled a 10-8 record in 1988, along with a 4.72 ERA. It would be Birkbeck's best season of a total of six where he'd see time in the majors. His career wouldn't end until seven years later, with one last look at the majors, with the Mets, and a trip to Japan. Birkbeck first made the majors with the team that drafted him, the Brewers. Milwaukee selected Birkbeck in the fourth round of the 1983 draft, out of the University of Akron. He made AA El Paso in 1985 and AAA Vancouver and Milwaukee in 1986. Birkbeck pitched in seven games in that first look at the majors, starting four. He got his first major league start Aug. 30. He lasted just 1.1 innings and gave up six runs. Going into that start, Brewers Manager George Bamberger heaped praise on Birkbeck, telling The Sentinel Birkbeck had "one of the better curveballs in baseball." Birkbeck returned to Milwaukee in 1987, starting 10 games. He went 1-4 with a 6.20 ERA. One of his losses came in a May game, continuing a long Brewers losing streak. "It's a humbling game," Birkbeck told The Associated Press after the loss. "You're going to win and you're going to struggle. But things will turn around. We'll be back." With the Brewers in 1988, Birkbeck made it to the beginning of June, then was sent down. By that time, he was 2-5 with an ERA north of 6. He returned in early July, after getting in regular work at AAA Denver, and won six-straight decisions. Birkbeck first win upon his return came July 5 against Kansas City, going 8.1 innings and giving up just one run. Birkbeck got win No. 8 Sept. 1, not giving up a hit in his first 4.2 innings of work. That Sept. 1 win was the final win of Birkbeck's season. Despite pitching in three more major league seasons, it was also his final major league win. Over the next seven major league seasons, Birkbeck started a total of 14 games. Between them, he went 0-6. He went 0-4 with a 5.44 ERA for the Brewers in 1989, then returned for one game three seasons later with the Mets, giving up seven runs in seven innings. After two seasons with 13 wins apiece at AAA for the Braves, with no call-ups, Birkbeck returned to the Mets for 1995. He got four starts for the Mets, going 0-1. But, in 27.2 innings of work, Birkbeck gave up just five runs. On May 29, he threw seven innings of shutout ball, well enough for a no-decision. By mid-June, Birkbeck was on his way to Japan, sold to the Yokohama Bay Stars. "This allows me to provide something for the family that I haven't been able to do," Birkbeck told The New York Times of the move to Japan. "The Mets have some wonderful pitching down below and I was basically a fifth starter. Whenever a move is made, that is the position that is impacted." Birkbeck played parts of two seasons with Yokohama, ending his professional career. He has gone on to coach in college, serving as associate head coach for the Kent State Golden Flashes. Among the pitchers he's overseen was Andy Sonnanstine, who topped the Kent State rotation in 2004. Sonnanstine credited Birkbeck's help with getting him to the majors, The Ravenna Record-Courier wrote in 2007, citing a 2005 Sonnanstine journal. "Birky, as we called him," Sonnanstine wrote, according to The Record-Journal, "taught me not only a great deal about pitching mechanics, but also about life."